Contest ends April 23, 2012. No purchase necessary. A purchase will not increase an contestants chance of winning. U.S. Residents only. Contestants must be at least 18 years of age to enter. pictureline will not verify receipt of entries. Incomplete entries are void. pictureline is not responsible for entries that are lost, late, misdirected, incomplete, incomprehensible, illegible, damaged, undeliverable or delayed. We reserve the right to substitute a prize of equal or greater value in the event that the original promised prize becomes unavailable. Grand prize valued at $2999.95, bonus prizes range from $100-$329. The odds of winning will depend on the number of entries. Unless otherwise noted, all contests and giveaway prizes are awarded via random drawing. 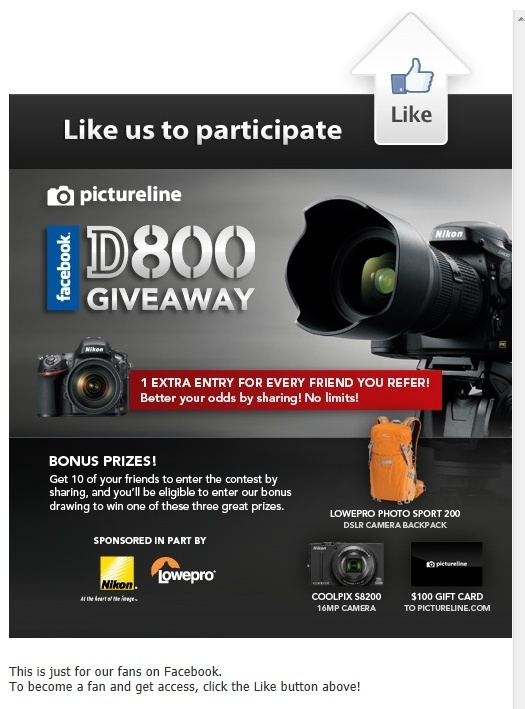 Winners automatically grant the use of their name and likeness in the promotion of this and other pictureline contests. This promotion is in no way sponsored, endorsed or administered by, or associated with, Facebook.